In the early days, Norwegian syllable “-vin” meant “natural meadows” and the former peasant district of Oslo had several names ending with -vin. 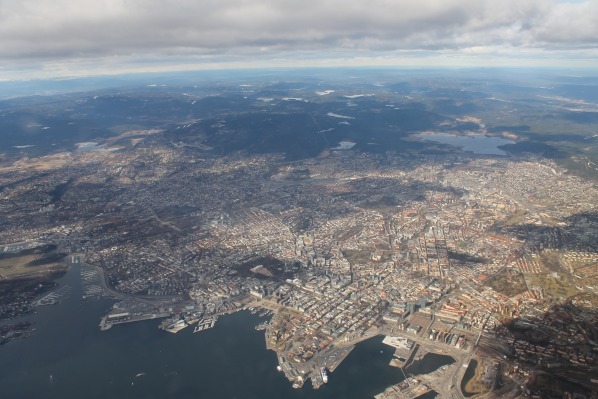 Oslo; this “wondrous city that no one leaves before it has made its marks upon him” (Hamsun, Hunger, 1890), has not always been the pulsating and hip urban district we see today. As we can read from the list below, Oslo has evolved from pure countryside to the most densely populated areas in Norway. The story is told through many still existing district names. Løren located between Sinsen and Økern is composed of “leirr” and “vin” (mud and meadow), and thus means something like “natural muddy meadow”. First mentioned in 1370. Vinderen means “the twisted by the meadow.” Vinð means “whoever winds” and was the Old Norse name of the Sognsvann stream that has always twisted downwards. Ryen by Manglerud is composed of the Old Norse word for rye and natural meadow. Once called “Rygvin” meaning “rye field”. Hovin is the only -vin name left in Oslo. The prefix hov means heathen hof pointing straight back to a place of worship in pre-Christian times. Ullern is composed of Ullr and vin, honoring the pagan ski god Ull through the name “Ull’s meadow”. Sinsen most likely derives from sinn, which means road. The name might be interpreted as the “meadow beside the road”, and would fit well considering the current Sinsen Interchange. Skøyen located by both Frognerkilen and Oppsal meant “Skade’s meadow.” The goddess Skade has given the name. Voksen was named Vagsin, composed of vagr and vin. The first syllable is probably an older name for the Bogstadvannet Lake. Bryn is a simplification of the Old Norse word brovin meaning meadow by the bridge. A great look at the interconnection of language and landscape.